When we first began Compass in 1993, we had a “picture” rule. I told my staff that they were to shoot me if I ever started putting my picture on our mailings. I was always somewhat annoyed that so many ministries had, what seemed like, pictures of the ministry leader on every page of everything they published. That seemed to me to be WAY over the top! Well, I guess it’s good the original Compass staff is not here to shoot me because now I’ve succumbed to my Internet programmers’ pleas to put my picture on the web. They believe that for someone to go to Israel with Compass, they want to know who they are going with and what they look like. It was a tough call because I know that it’s the Lord Who brings people on our trips, not fancy advertising copy or photos. But on the other hand, if God uses this for one more person to experience the spiritual growth of a Biblelands trip, it will have been well worth me having to eat my words! So now they want me to write something about myself, my background, how Compass got it’s start, etc. See, when you start compromising like I did with the picture, you open the door to all sorts of misery! So here goes…. playing baseball, basketball, football, golf, tennis and track. I was active in the United Methodist Church youth groups, even spoke once at an Easter Sunday sunrise service, but had no personal relationship with the Lord. Accepted a basketball scholarship to a community college, 1967. Spent nine months active duty in the National Guard, 1970. Transferred to Auburn University (War Eagle! ), Business Major, 1971. Held several offices in fraternity (SAE) and had decent role in an Auburn Theater Department touring musical, ’72. My senior year at Auburn I purchased, built, owned and operated four girls dorms, 1973-74. Developed and sold 30 unit townhouse project in Auburn, 1974. Met the love of my life, Susie Paul, at Auburn, married 1975. Developed a large (150 seat) theme restaurant from scratch in Auburn, 1976. Moved to Birmingham and built houses, 1977. God saved me, and Susie a few months later, 1978. Owned and operated several businesses before moving to Vail, Colorado to plant Vail Bible Church, 1983. I was not the pastor, just the cheerleader. While we lived in Vail I owned and operated several marketing oriented businesses, a health care company in Boulder and started a couple of television stations from scratch. Some of the businesses were great successes and some were great failures. You learn more in failure than in success. Started the first Steeling the Mind Bible Conference in Vail, Aug, 1993. Moved to Coeur d’Alene to take a job with Koinonia House, Nov, 1993. 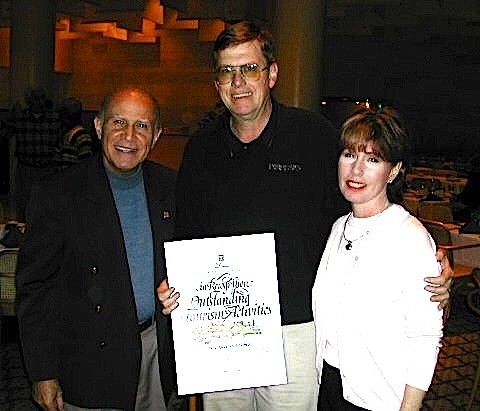 Founded Compass International, Inc., Feb, 1994, and took my first Israel trip in February, 1994. Compass has taken on many projects including Compass Magazine, 1997 (today is Compass Communique); Good Morning Lord! email Bible study, 2000; Produced feature film, Hinds’ Feet on High Places, 2001. 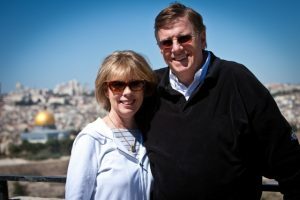 Bill & Susie Perkins honored by Israel’s Department of Tourism for bringing groups for 18 straight years (at the time- now over 55 trips in all to Israel). Designed Empty Tomb Jewelry, 2004. Since founding Compass in 1993, I have been the Executive Director. I spend my days writing and planning events. We have incredible God-given employees- one full-time/four days a week, four part-time and other volunteers. We typically organize groups to Israel two or three times a year, organize two or three Steeling the Mind Bible Conferences a year, send out monthly Compass eNews and Compass Pointe articles, send out daily Good Morning Lord! Bible studies and ship (or download) DVD Bible studies each day to people around the world. For fun I love to spend time with my wife Susie, play golf, relax on Hayden Lake with the grand-kids, work on our house, and write books and articles defending pre-millennial, pre-tribulational doctrines using a literal hermeneutic. Not having been to seminary, over time I have acquired a large library of some 1200 reference books that act as my Biblical resources. Received an honorary diploma in Biblical Studies from Liberty University. While in business graduate school, Susie was Executive Director of a health care company with 150 employees. Since having kids, Susie has been a stay-at-home mom and home-schooled our two daughters. I believe she is the most competent and scripturally accurate women Bible scholar on the planet. Our many many long Biblical discussions have been incredible “steel-on-steel” for me. She wrote Secrets of a Satisfied Women (best-seller, 130,00 copies), 1997 (It’s out of print). Susie also did a Compass DVD Bible study, Back to the Garden, on how to deal with husbands (imagine living with me!). It’s included in the our Marriage on the Rock DVD set. Both our daughters attended Torchbearers Bible Schools after high school. Jamie, 33 and Taylor, 26 are both married and we have five grand-kids. Both trusted Jesus about age four and never looked back. Each has been to Israel over 10 times. We have a beagle named Bagel. I thank the Lord for being so gracious to my many mistakes! Shalom! That’s about it for the highlights of my life—I skipped a lot of stuff trying not to bore you. Lots of ups and downs, but you can see why I think I’ve had anything but a normal life! Most important life lesson: There is nothing I can do or not do, to make myself any more or less acceptable to God, or more or less sanctified. My works are as filthy rags and it’s only about what He did on the cross.